Ho Chi Minh City will have video surveillance to curb dumping of garbage on the streets, said Deputy Chairman of the municipal People's Committee Huynh Cach Mang in the television program “ Listen and talk” focusing on administrative fine on environment pollution in public places and residential quarters. Closed-circuit television cameras will be installed on almost every street corner in HCMC. Urban order management teams and construction inspectors will patrol the streets and issue fines on those who drop litter in the streets base on camera pictures. Deputy Director of the Department of Natural Resources and Environment Nguyen Thi Thanh My said the city produces 8,900 tons of waste from daily activities per day. Apart from that public places produce around 2,300 tons of litter a day. From the beginning of the year till now, urban inspectors have handled over 450 violations collecting more than VND1.3 billion ($55,728 ); however, fines don’t deter people from throwing litter away on streets. 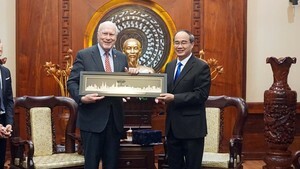 Chairman of People’s Council Nguyen Thi Quyet Tam said in the last time, city authorities had issued guidance on environment issues; however, inspectors have relented in imposing fines while people’s awareness of keeping hygiene in public places and residential quarters have seemed so low; therefore, environment violations have not been rolled back. 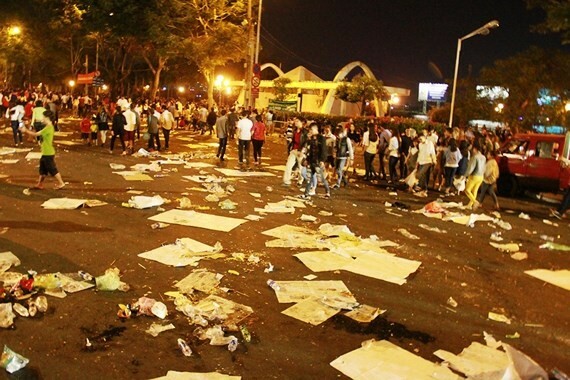 Deputy Chairwoman of the Vietnam Fatherland Front Committee Trieu Le Khanh suggested HCMC should launch a campaign to encourage people in protecting environment especially dropping litter and urinating in public places. Additionally, city authorities will build regulations of environment protection from taking residents’ opinions; people will self-consciously follow the regulations. Present voters at the TV program proposed increasing fines comprising of paying money and doing community service work. Ms. Nguyen Thi Thanh My said violators will receive fines as per the resolution No. 155/2016 adding that urban order management team and construction inspectors in districts have to oversee the regulations. As per the resolution 155/2016 on administrative fine for dropping litter in public places, violators will pay VND500,000 to VND1 million for throwing cigarette butts and ash in commercial centers or public places. Those who urinate in streets will receive a fine of VND1-3 million. Residents will be fined VND3 - 5 million for leaving waste household garbage in wrong places and VND5-7 million for leaving household garbage in sidewalk or drainage system throughout the city.